Gold Prospecting Books. Learn how to Mine for Gold and Find Gold Nuggets. There is still plenty of gold out there waiting to be unearthed, but it takes time and research to find the good areas to go. Here are some mining related eBooks that will help in your hunt for gold. Some are focused on different types of prospecting methods, and others focus on the various gold bearing locations throughout different states. 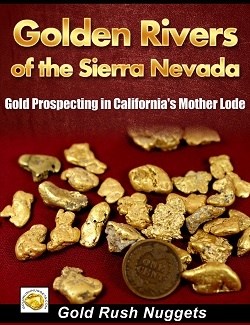 Golden Rivers of the Sierra Nevada is an excellent resource for prospectors in northern California. It documents 11 of the richest gold-bearing rivers in California's Sierra Nevada Mountains. This is an eBook, which will be emailed directly to you as a printable-PDF at the time of purchase. A great resource for California miners! Start Finding Gold! 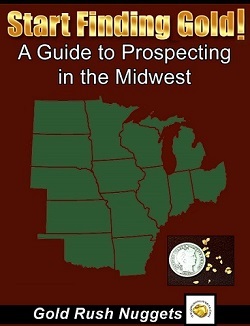 - A Guide to Prospecting in the Midwest is an excellent resource for prospectors in the Midwestern U.S. It documents gold-bearing locations throughout the states of Arkansas, Illinois, Indiana, Iowa, Kansas, Michigan, Minnesota, Missouri, Nebraska, North Dakota, Ohio, Oklahoma, South Dakota, and Wisconsin. Finding gold in the Midwest can definitely be a challenge, so learning about areas where it has been found before is very important. This is an eBook, which will be emailed directly to you as a printable-PDF at the time of purchase. A great resource for serious Midwest miners! Start Finding Gold! 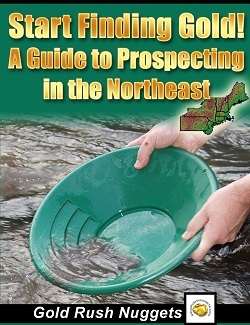 - A Guide to Prospecting in the Northeast is a great great resource for prospectors who live in Maine, New Hampshire, Vermont, Rhode Island, Connecticut, Massachusetts, New York, and Pennsylvania. This is an eBook, which will be emailed directly to you as a printable-PDF at the time of purchase. 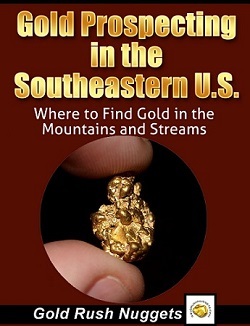 If you are serious about finding gold in the Northeastern U.S., then this is a must-have resource, as there is very limited information out there on gold in this part of the country! Start Finding Gold! - A Guide to Prospecting in Montana takes a look at the gold bearing locations throughout Montana, primarily located in the western part of the state. This is some of the most beautiful country in the US and there is good gold here too! This is an eBook, which will be emailed directly to you as a printable-PDF at the time of purchase. Metal Detecting for Gold - Expert tips for finding gold nuggets with your metal detector gives a comprehensive look at how to find gold with a metal detector. 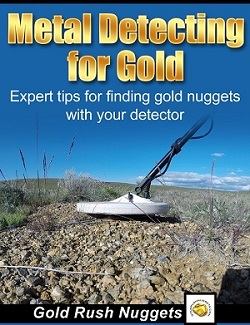 It includes great information about selecting a gold detector, how to properly research areas to prospect, properly using your detector, and tips and trick to increase your success. This is an eBook, which will be emailed directly to you as a printable-PDF at the time of purchase. If you are serious about finding gold nuggets with a metal detector, then this is a fantastic resource! 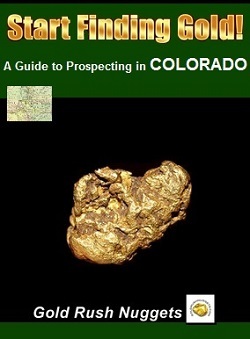 Start Finding Gold - A Guide to Prospecting in Colorado is a great great resource for any Colorado prospector. It details the many gold-bearing areas throughout the state. With its rugged terrain and ample public lands, there are countless areas that you can still find gold in Colorado. This is an eBook, which will be emailed directly to you as a printable-PDF at the time of purchase. 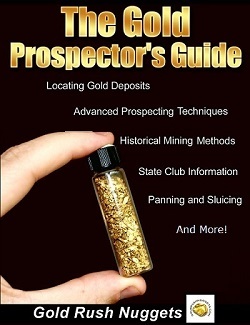 The Gold Prospector's Guide is a great great resource for all prospectors who want to learn about finding gold. It covers various prospecting techniques and historical indicators that will help you find gold bearing areas. This is an eBook, which will be emailed directly to you as a printable-PDF at the time of purchase. Gold Prospecting in the Southeastern U.S. is a great resource for prospectors in the Southeast. It documents the gold bearing locations throughout Alabama, Georgia, Tennessee, South Carolina, North Carolina, Virginia, and Maryland. This is an eBook, which will be emailed directly to you as a printable-PDF at the time of purchase. A great resource for Southern miners! Start Finding Gold! 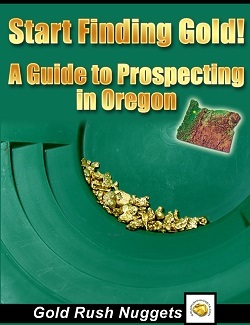 - A Guide to Prospecting in Oregon is a great great resource for Oregon prospectors. This is an eBook, which will be emailed directly to you as a printable-PDF at the time of purchase. If you are serious about finding gold in Oregon, then this is a must-have! 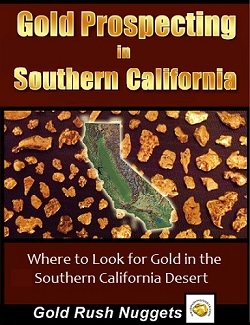 Gold Prospecting in Southern California will lead you to gold bearing areas in the southern part of the state. It includes mining districts in Kern, San Bernardino, San Luis Obispo, Santa Barbara, Ventura, Orange, Los Angeles, Riverside, Imperial, and San Diego Counties. This is an eBook, which will be emailed directly to you as a printable-PDF at the time of purchase. A great resource for miners in Southern California! Start Finding Gold! 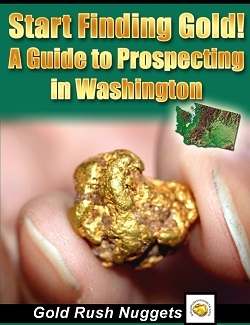 - A Guide to Prospecting in Washington is a great great resource for Washington prospectors. This is an eBook, which will be emailed directly to you as a printable-PDF at the time of purchase. This is a great resource to get you started finding gold in Washington State! 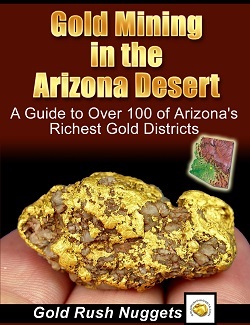 Gold Mining in the Arizona Desert - A Guide to Over 100 of Arizona's Richest Gold Districts is a great great resource for Arizona prospectors. This is an eBook, which will be emailed directly to you as a printable-PDF at the time of purchase. Millions of dollars' worth of gold has been mined in Arizona, and there is still plenty waiting to be found! Start Finding Gold! 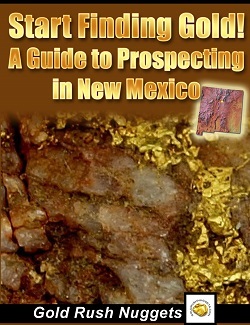 - A Guide to Prospecting in New Mexico is a great great resource for prospectors in the Land of Enchantment. This is an eBook, which will be emailed directly to you as a printable-PDF at the time of purchase. This is a great resource for anyone looking for gold in New Mexico! Start Finding Gold! 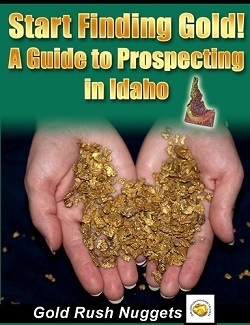 - A Guide to Prospecting in Idaho is a great great resource for Idaho gold prospectors. This is an eBook, which will be emailed directly to you as a printable-PDF at the time of purchase. 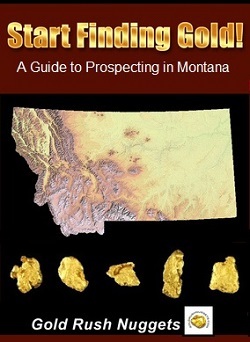 If you are serious about finding gold in Idaho, then you will want this eBook. 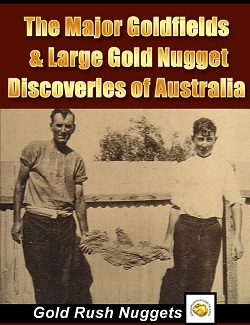 The Major Goldfields and Large Gold Nugget Discoveries of Australia is a great great resource for Aussie gold prospectors. It documents hundreds of rich gold districts and where some of the largest gold nuggets have been found in the country. This is an eBook, which will be emailed directly to you as a printable-PDF at the time of purchase. Gold can be found in every state in Australia, and this eBook gives a general overview of the gold occurrences in each state. 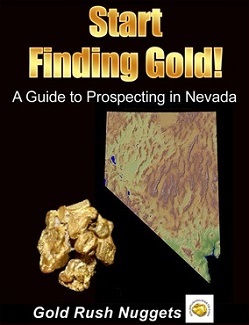 Start Finding Gold - A Guide to Prospecting in Nevada takes a look at gold locations in all 17 counties in the state. The vast mineral wealth, along with the extreme remoteness of many of the goldfields makes Nevada one of the best places left in the U.S. to find gold today. This is an eBook, which will be emailed directly to you as a printable-PDF at the time of purchase. Currently the #1 producer of gold in the country, there is definitely a few nugget still waiting to be unearthed! Utah Gold! 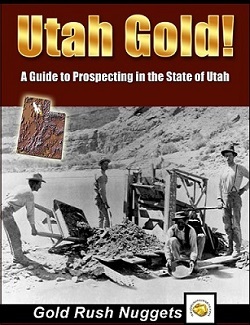 - A Guide to Prospecting in the State of Utah takes a look at the gold bearing locations throughout Utah. One of the largest gold producing mines in the U.S. is located here, and many areas throughout the state will still produce gold. This is an eBook, which will be emailed directly to you as a printable-PDF at the time of purchase. Start Finding Gold! 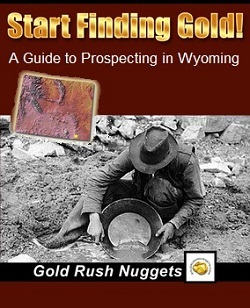 - A Guide to Prospecting in Wyoming takes a look at the gold bearing locations throughout Wyoming. Perhaps one of the least prospected states in the western U.S., there is good gold here if you know where to look! This is an eBook, which will be emailed directly to you as a printable-PDF at the time of purchase. Alaska Gold! 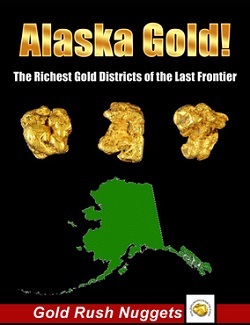 - The Richest Gold Districts of the Last Frontier takes a look at the richest gold bearing areas throughout Alaska. It's no secret that Alaska is one of the best states in the USA to mine for gold. This is an eBook, which will be emailed directly to you as a printable-PDF at the time of purchase. 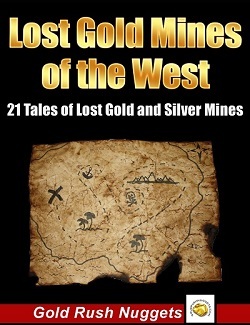 Lost Gold Mines of the West - 21 Tales of Lost Gold & Silver Mines takes a look at some of the famous lost mines throughout the western U.S.! There is lost treasure out there just waiting to be found! This is an eBook, which will be emailed directly to you as a printable-PDF at the time of purchase. 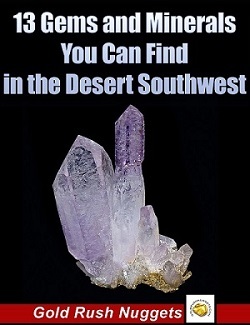 13 Gems and Minerals You Can Find in the Desert Southwest takes a look at 13 or the most desirable gems and mineral types found in the Southwest United States and where they are found. This is an eBook, which will be emailed directly to you as a printable-PDF at the time of purchase.